Meir Javedanfar looks at how Western sanctions on Iran are enabling violence in Syria to continue. 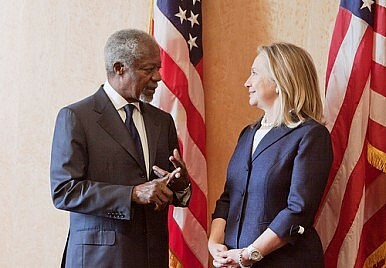 International envoy Kofi Annan has arrived in Syria to boost efforts to settle the current Syria crisis. With the bloodletting continuing unabated, the international community should remember that Iran is deeply involved in the Syrian crisis. Iran is Assad’s biggest ally and financial backer, and Iran’s elite military force, the Revolutionary Guard Quds Force, has been present in Syria to assist Syrian security forces. It would follow that if a peaceful solution to the Syria crisis is to be found, all sides have to be involved, including Iran. But Iran has been totally excluded from the talks. One has to ask why Iran was left out. There seem to be a number of direct and indirect reasons. First, according to the Tehran-based Entekhab News quoting the Lebanese Al Safir newspaper, Turkey’s insistence that Iran be excluded from the Geneva conference seems to have played a major part. The reason being that Turkey is angry at what they see as Iran backing Assad in the recent Turkish-Syrian dispute over the unarmed Turkish F-4 fighter jet shot down by Syria. The Turks are unlikely to have been alone in their opposition to Iran being invited to the talks. Western countries, especially the U.S., are likely to have backed them. Currently, the West is involved in an extensive sanctions and isolation campaign against Iran in order to weaken its influence and leverage at the nuclear talks. Including Iran at the Syria talks could have the opposite effect. It could instead provide Iran with leverage, something which Tehran could use to extract concessions from the West. Such a move would be very logical on Iran’s part. Using its Syria leverage at the talks, Iran could possibly offer an exchange. For example, in return for some concessions on Syria, Iran might ask the U.S. to pressure the Bahraini government to stop its current crackdown on local Shiite activists. The mere mention of such a tradeoff would boost Iran’s position between Shiites of Bahrain and elsewhere in the Middle East as their savior and protector. Including Iran in the diplomatic process over Syria would provide an opportunity for Khamenei to use his influence over Syria to extract concessions from the West during the ongoing nuclear negotiations. Saudi Arabia and Syrian opposition groups were also snubbed. Both would have been dead set against Iran being invited and being involved in the current diplomatic process. When it comes to being included in the diplomatic efforts to find a solution to the crisis, it seems for now that Iran is the victim of its own rising isolation. Even Russia, which is closer to Iran’s position with regards to Syria, is not insisting in any meaningful manner to have Tehran involved in any future negotiations, though it did suggest they should have been invited. For now, the more Assad is weakened and isolated, the bigger the possibility that Iran would lose its influence in Syria. A stable and democratic Syria, post-Assad, could mean Iran losing its influence there. However, its fortunes could soon change, for all the wrong reasons. As the current massacres in Syria continue, should the Assad regime collapse in a civil war and the Alawite civilian population come under attack from Al Qaeda groups currently in Syria, they are likely to turn to Iran for help as Shiites and Alawites are religiously close. This is especially true if a massacre against them takes place, something which judging by the nature of some of the extremist Saudi financed Sunni forces in Syria is entirely possible. Should it happen, Iran would be able to easily dispatch help through its Hezbollah allies in Lebanon. Such a possible scenario would not only boost Iran’s position in Syria and with the region’s Shiites, it would also make it an intractable part of any future solution for the country’s future. To avoid giving Iran such an opportunity, much pressure must be brought upon outside supporters and leaders of the Sunni rebels to ensure that they realize that any attack on Alawite civilians would carry a heavy diplomatic and political price for them. Just as pressure is brought upon Assad to stop killing Sunnis and other civilians, the same amount of pressure should be brought upon Sunni anti-Assad groups. Protecting Syria’s Alawites in case of civil war would not only be a humanitarian achievement, it would also be a strategic win for the West and the Arab world as it would deny Iran the opportunity to maintain its foothold in future Syria. The world ignored the plight of Lebanon’s persecuted Shiites in the 70s and the 80s, thus giving Iran the opportunity to gain their support by helping them through Hezbollah. This has enabled Iran to maintain its presence in Lebanon until today. The West and the Arab league should not make the same mistake again with Syria’s Alawites, a minority whose civilian population could become victims of attacks, or possibly even attempted genocide during Syria’s civil war or even after it. Should they do that, Iran would be more than willing to step in. Washington has seen all roads in Damascus as leading through Tehran. Why time and compromise could lead to a deal that saves lives.